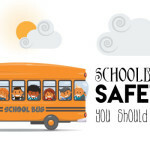 School bus transportation and its safety are what matters most to parents as well as school authorities. Student safety is not the responsibility of school bus driver alone. Everyone, including students, has a unique role to play in assuring safety. With the introduction of school bus driver console app , driving has become easier for drivers. Using the app, they are able to have better control over each school bus ride. Also, it helps to keep the bus under surveillance from inside, helps mark attendance, assists in planning route, makes coordination with transport manager easy, etc. Drivers are able to perform multiple tasks with minimum disturbance. 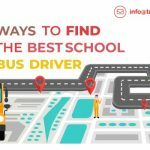 School Bus Driver Route app is a great solution for managing school buses in an effective and efficient manner. 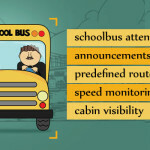 School bus driver console app allows drivers to plan each trip carefully and easily. Your bus driver can set routes, set the number of stops in a single trip, etc., allowing the driver to decide beforehand and act wisely according to your plan. The Driver Console app shows the profiles of students to be picked from each stop in an organized way. Drivers are able to select the shortest route from their console and thus plan the trip properly. Bus speed can be monitored in real-time using the app. That is, parents as well as school authorities can check out whether the school bus is over speeding or if they are making unnecessary stops. Hence it is possible to keep an eye on drivers and send alerts to them if necessary. One of the biggest benefits offered by the app is to get an idea about the good and bad driving habits of drivers. Multiple cameras are installed in buses which give driver live feed of students on board. Drivers can view what's happening in the school bus through this console with the help of school bus driver route app. It is very advantageous for drivers as they are able to observe children without leaving their seat. Live cam feed saves time and at the same time adds safety and is convenient to the driver. 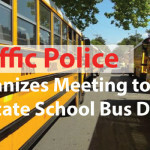 App assists drivers in taking school bus attendance. By using the app, drivers can easily spot missing child in the school bus. As the students board the school bus, attendance will be taken. Driver console contains details of each student who are boarding from a particular stop. Radio Frequency Identification (RFID) cards will be provided to each student and with the help of those cards, student attendance can be taken. Taking school bus attendance is the greatest benefit offered by the app as it gives instant warning to drivers, parents and other school authorities if a student is missing. Why is the Driver Console App a Necessity for Schools? With the help of driver console, important announcements can be delivered to students. Drivers are able to interact with the students through the driver route app which indeed gives them provision to make important announcements. 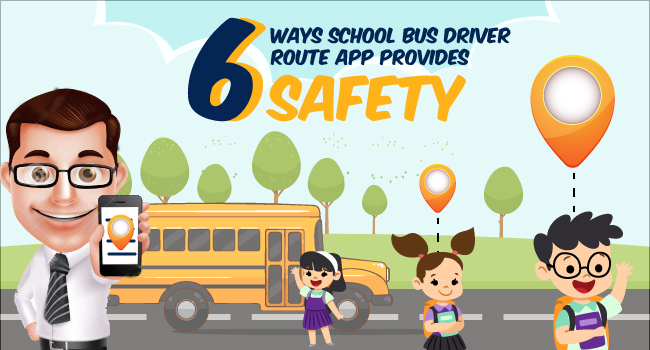 Hence the app helps drivers to maintain discipline inside the school bus. Similarly, transport managers are also able to play audio on the bus and thus make announcements as well as play informational audio. With the innovative school bus driver route app, school bus drivers are able to enjoy and have better control of the school bus. Technology has made driving an easier and safe one. The app makes it easy for the driver to stay in control. Introduction of Driver Console app has opened up a new and enjoyable driving experience to drivers. Risk and tension of parents, teachers and drivers are reduced to the minimum.